Character - Leader - Jedi. Points: 12/16. Health: 11. 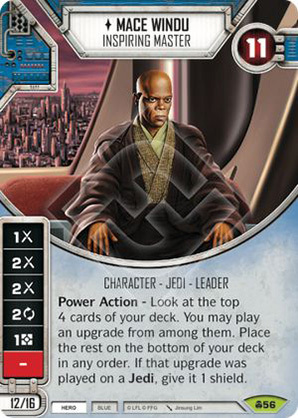 Power Action - Look at the top 4 cards of your deck. You may play an upgrade from among them. Place the rest on the bottom of your deck in any order. If that upgrade was played on a Jedi, give it 1 shield.